On April 24th of this year Google released another major search algorithm update called “Penguin” in its ongoing effort to clean up search results. In its most recent move, Google eliminated Google Places and replaced it with Google Plus Local to increase user interactions on Google Plus. This is just the beginning. Google further plans to interface Google Plus Local with Zagat to create a more seamless online review platform. Dental practices and dentists listed on Google Places should have been notified about the conversion to Google Plus Local. It’s important that you check your Google Plus Local listing now because Google is integrating Google Plus Local with Google Maps. You don’t want your dental practice listing to suddenly disappear from Google Maps search. The migration from Places to Google+ Local has changed the Dashboard view of your dental practice listing and currently all business listings no longer display whether they’ve been claimed or verified. It seems to be a work in progress, so you will want to sign into your Google account once a week and check what is happening with your listing. Google’s plan is that with a Google Plus Local listing, your dental practice will be found through many online avenues like Google search, Google Maps, mobile search and Google Plus, along with the ability for users of Google Plus to recommend your dental practice to their family and friends. They can also write an online review about your dental practice — all in one place. While this may make it easier for users to find you locally, it’s a bit of a hassle to manage as a business owner. Right now there isn’t a way to seamlessly manage your Google Plus business Page and your Google Local Listing from one location. Google’s plan for the very near future is to enable easier management of your dental practice presence across all of Google’s platforms through a single Google Plus business page. As of this writing, Google has not announced a time frame for this enhancement. In the interim, you technically have two Google Plus “pages” that you need to be checking — your Google local listing and your Google Plus business page. If you haven’t set up your dental practice with a Google Plus page now is the time to get on board with Google Plus. If you still find Google Plus confusing, check out Julie Frey’s article, Dental Marketing with Google Plus that walks you through setting up a Google Plus account. We will keep you posted on the changes to Google Local as Google releases new information. What are your thoughts on the changes to Google Places? Dentists, have you heard the one about the blind man driving to Taco Bell? Turns out, it’s no joke. The Google self-driving car project in was announced in 2010 as a way to make driving safer, more enjoyable, and more efficient. This week Google shared one of their favorite test-drives on YouTube to celebrate 200,000 miles of safe driving. In this trending viral video, Steve Mahan, who is legally blind, took the car for a drive on a carefully programmed route to experience being behind the wheel. The test drive was a technical experiment where the car drove the passengers to a Morgan Hill, California Taco Bell for tacos. Dentists, would you own a self-driving car? Do you think there will come a day when we will have a robot adjusting braces? Actor Nathon Fallon may think so. This week’s Friday random viral video features Fillion demonstrating his own personal “Google Maps Pose” on Jimmy Kimmel Live. What is a “Google Maps Pose” you ask? It’s the stand you take when the Google Maps Street view car is driving down the street you happen to be on, and it looks like a picture of you is about to be taken. Don’t worry, Google blurs the facial images of people they might catch with their street car camera, but regardless, Nathan Fillion thinks you should strike your own unique pose. On the Jimmy Fallon show Fillion describes how he first encountered the Google Maps Street View car coming down his street towards him. Thinking fast, he decided to come up with a “Google Maps Pose.” Jimmy Fallon encouraged Nathon to demonstrate his official pose for all to judge. Kimmel admits never seeing a Google Maps car before and asked what they look like. 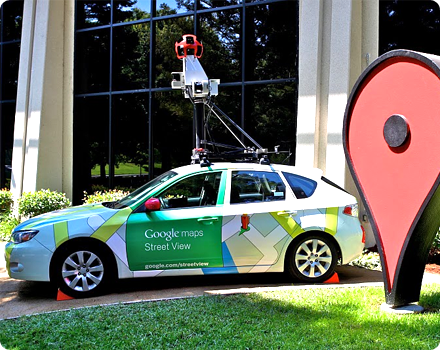 Have you ever seen the Google Maps street car coming down your street? Do you think striking your own “Google Maps Pose” can further compliment your Internet dental marketing efforts?